A unique Butoh performance will take place in The Shed, Centre Pier, Galway Harbour on Friday August 9th next at 6pm. This is a free event and is part of the programme of The Kitchen Table Artists Collective in The Shed. The Kitchen Collective, formed by local visual artists in 2011 was part of TULCA – AFTER THE FALL in 2011 and held a residency in The Shed in May 2012. 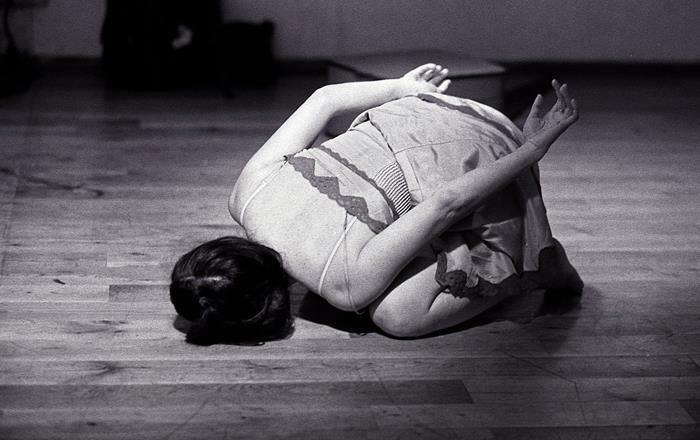 This performance is the result of a collaboration between local artist Judith Bernhardt and Galway Dance Project to develop a Butoh performance with Dublin based Butoh practitioner Ambra Bergamasco and a group of local dance and visual artists. This performance is the outcome of an intensive workshop in which the group explored the foundations of what Butoh practice can be. Butoh is the collective name for a diverse range of activities, techniques and motivations for dance, performance, or movement and is traditionally performed with slow hyper-controlled motion, with or without an audience. There is no set style, and it may be purely conceptual with no movement at all. Its origins have been attributed to Japanese dance legends Tatsumi Hijikata and Kazuo Ohno. The event is free and open to the public. The six performers are Judith Bernhardt, Elise Brown, Bernie Divilly, Elodie Rien and Kathryn Crowley. Butoh dance originated in Japan in the late 50s. Inspired by German expressionism on one side and the legacy of the Atomic bomb explosion, Butoh dance looks at the body from its internal understanding allowing form unforeseen possibilities of expression. Kazuo Ohno describes it as the dance of the soul. Galway Dance Project was established in 2011 to support the development of dance in Galway. It provides a programme of professional level dance classes, workshops and events and is working towards securing a dedicated space for dance in Galway city.